Any Fixer-Upper fans out there?! I LOVE me some Chip and Joanna Gaines, and their HGTV show is one of my favorites! A popular classroom theme the past couple of years has been their "Fixer-Upper" style- lots of shiplap, chicken wire, and burlap! But, let me tell you, I had a REAL Fixer-Upper Classroom this year! I have learned this year to hold everything, especially my dreamed-up perfect classroom, with my hands open! It's been such an awesome opportunity to teach at a very new school - and to be here for 3 years now! My first year here was the third school year of Hope International School. Every year has been very different - both with it's challenges and successes! This year (it's 5th). as been especially exciting, as we've moved into our OWN campus!! They worked hard to get it ready for us, and it's been really neat to be a part of the progress. When I left Tanzania at the end of last school year (mid-June), we had moved our entire school to this new campus, and the building my classroom would be in WASN'T EVEN BUILT YET. Fast forward to August, and we arrive back, ready to set up our classrooms for the new school year, and this is what mine looked like. I'm sure your face looks like mine did!! We had a building, and rooms, but were still waiting for plaster to dry and concrete to harden. We had to be flexible- as we weren't able to get into our classrooms until 3 days before the students came!! We were able to get paint on the walls, though, and this is what my classroom looked like before I started working. But, MUNGU NI MWEMA (God is good), and we were able to get things set up enough to function for the first few weeks of school. We had our meet-and-greet the day before school started, and it was awesome to see our excited kiddos! Some of the parents didn't even notice that the windows, doors, and ceiling were missing! 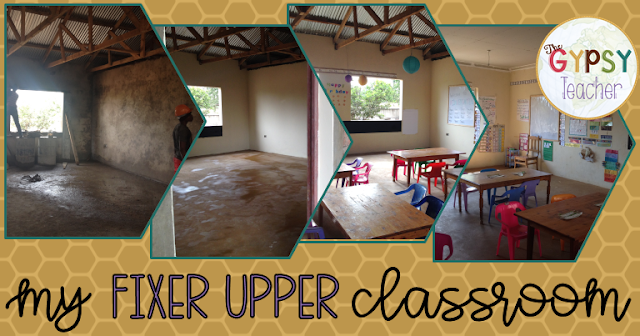 We were lacking in funds to complete our classrooms, but we made the best of it! Packing everything up into our closets at the end of every day, and bringing them back out every morning, was not ideal. But, by God's grace, we made it work, and the kids hardly noticed. I was SO thankful that, due to a large donation by one of the parents, we were able to get windows and doors put on our classrooms by the end of the first week of school! It took us a couple of months to get ceiling boards, which meant lots of dust and ashes (they burn trash here) entering our classrooms. But, on the bright side, it was a breeze to hang things from the ceiling! It was very "open concept" too! Bright, airy, and cool, as the heat was able to rise high into the rafters. We were all very thankful not to have hold class at the picnic tables outside! In October, we got another large donation and we were able to get ceiling board and electricity! That means, out with the dust and sound coming from the Pre-School and 1/2nd Grade rooms, but in with quite a bit more heat and echo. It all takes time to adjust- but we are VERY happy to have both of those things! Especially electricity!! The back wall of my classroom is mainly used for my word wall. I used 12x12 scrapbook paper squares and this chalkboard word wall pack for the letters and student names. Under the word wall is where I store all our center baskets, table baskets, pencils/sharpener, and Friday Folders. It's not super organized, but it's nice to have somewhere to keep everything! Each basket is marked with what center it goes to. I LOVE that my room has so much natural light! The four windows make it feel brighter and more spacious. I love opening them up to get a nice cross-breeze. The front of my classroom is one of my favorite parts! We have a white board and chalkboard, which I really appreciate. The calendar area is colorful and fun! The clip chart worked really well for my kiddos this year too. Here's our whole-group teaching area! All my kinders sat in a circle on the floor. I use the whiteboard to teach on. My cart next to my chair was super useful for teaching supplies! I love my class rules by Simply Kinder! Thanks for coming on my classroom tour! "Fixer-Upper Classroom" took on a whole new meaning for me this year! What theme is your classroom? What's your favorite part of yours? It's Summertime and the Teachers are HAPPY! !